The Courses Block allows the instructor to view each course they have access to in one place, and to be able to easily switch from one to the other for organizational and editing purposes. This block can be added to the My Home page or inside of a course. 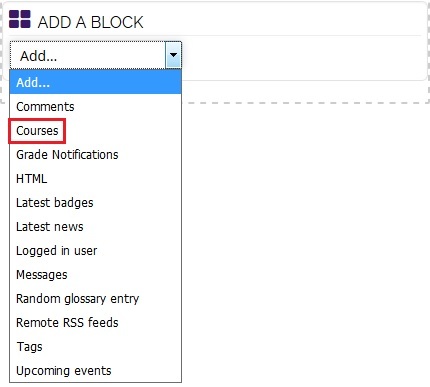 If added to a course, the block will also appear for students and will show their courses. 2. Click on the Edit button at the top right of the page. 3. Click on the dropdown menu in Add a block. Select Courses. 2. Click on the Edit button in the top right. 3. Locate the Courses block and click on the Actions (gear shaped) icon. 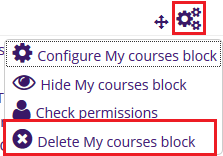 Select Delete My courses block from the dropdown menu.